He was born in Florence on 02.06.1962. He graduated with honours in Economics and Banking at the namesake Faculty of the University of Siena on 24.1.1989, presenting a dissertation on Financial innovation and the instruments of the international financial markets. In March of the same year he began his career in the world of banking and finance, holding various managerial roles until in 2006 he was appointed to the position of Deputy Director General at MPS Capital Services Banca per le Imprese S.p.A. – Firenze (Gruppo MPS). In this position he was directly responsible for about thirty “Specialists” distributed over 10 Operational Points throughout the country, serving direct clients and those from the SME Centre network of the MPS Group for ordinary and structured medium and long-term loan origination operations. From the spring of 2010 he was also appointed as Acting Deputy Director General of the Bank and since April 2014 held the office of Deputy Manager of the Corporate & Investment Banking Section, with direct responsibility for the Strategic Marketing and Corporate Products Area. 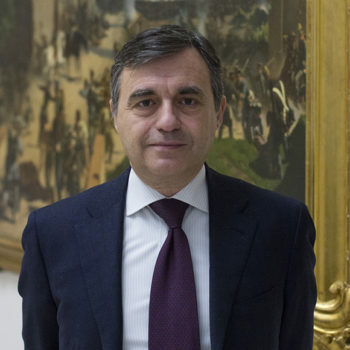 In December of the same year he was invited to manage the Fondazione Cassa di Risparmio di Firenze performing the functions of Director General.